Figure 6.1 provides an overview of areas of community safety across Devon. 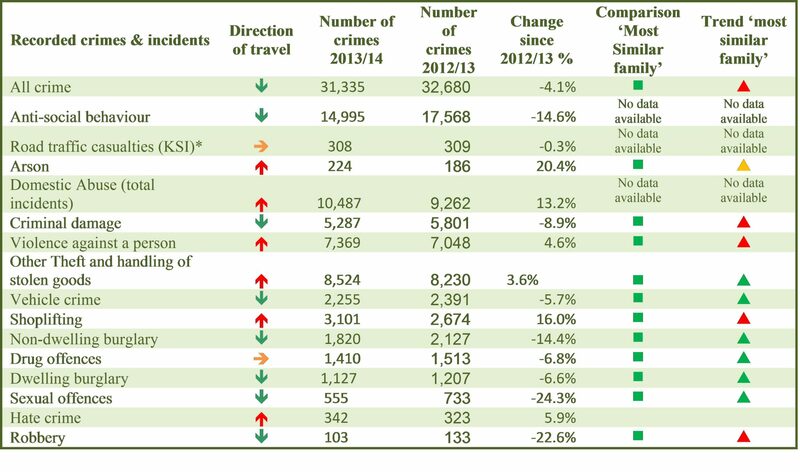 It shows the overall trend in reported crimes and incidents, as well as a comparison of Devon with a group of other community safety partnerships with similar geography and demographics to Devon. The information is taken from the Devon Strategic Assessment technical report http://www.devon.gov.uk/devon_strategic_assessment_2013.14technical_report_2014.pdf and further detail on different types of crime can be found in the assessment and also overlaps with different sections of this Devon JSNA overview. 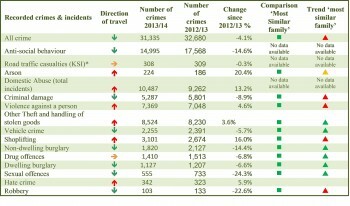 Overall there has been a reduction in crime across Devon, although there is variation between different crimes. There has been an increase in arson, domestic abuse, violence against a person, other thefts, shoplifting and hate crime. There has been a reduction in anti-social behaviour, criminal damage, vehicle crime, non-dwelling burglary, dwelling burglary, sexual offences and robbery. No change has been seen in drug offences or in the number of people killed or seriously injured in road traffic accidents.